There’s a moment early in the film Volver where Almodovar reveals Carmen Maura, his glamorous star of yesteryear, done up as an unkempt old lady, and though it’s easy to google her and see that she’s doing fine in real life, the transformation is wrenchingly poignant. I thought of it last night at the War Memorial despite Karita Mattila’s failure to look a day older than she ever has, because I recall her Jenufas as if they were yesterday, and yet here we are. Batons have been passed. Die Zeit, die ist ein sonderbar Ding and all that. Mattila’s is the greatest triumph in what is a near perfect production of Jenufa at San Francisco Opera. 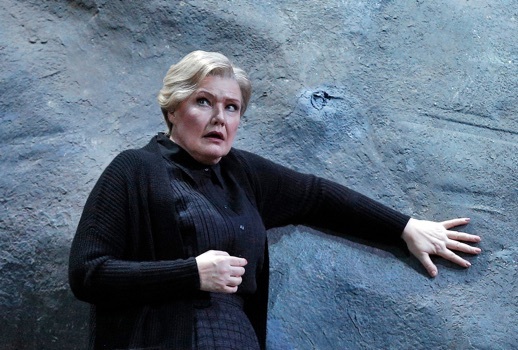 For all the times I heard Mattila sing Jenufa herself—five or six times, I daresay—I had the unshakeable feeling on Tuesday night that I had heard her sing the Kostelnicka before. The role is an uncanny fit. Yes, there are phrases in the lower reaches of the role where her voice is a chalky figment, but she makes it work and, more importantly, lives the role. I’m not interested in vocal comparisons to Leonie Rysanek, but one thing she shares with that great artist is the ability, through some wizardry, to tower over singers of similar stature, to be terrifying through a simple change in posture. This is a kind of stage instinct she has always had, but it has rarely been so integrated with vocal gesture as it is here. The “Co chvíla” monologue in Act II was utter devastation. Probably, if I had to compare, finer than Silja’s, if only because whatever time has done to Mattila’s voice is not of detriment in this score. This may be her greatest role. Mattila has an extremely able partner in Malin Bystrom, whose full lyric instrument moves with apparent ease around the part, even in the exposed, high-flying phrases of the second act prayer. 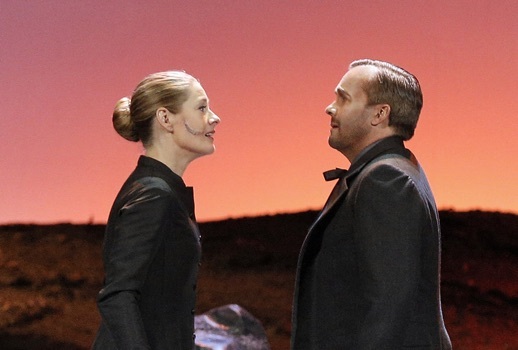 There is a throaty quality in the mid-range that recalls Soderstrom, and an unforced stage presence reminiscent of Mattila’s Jenufa, though the characterization is her own. This is a role debut for Bystrom, but I wouldn’t have known it if it weren’t in the press kit. Her singing in the final duet with Laca was especially radiant. The last time I heard William Burden must have been fifteen years ago as Belmonte at Glimmerglass. I surmise on the basis of the youthful ardor that still suffuses his voice that he as at some point made a deal with the devil. The consonantal shitstorm that is Czech seems to trouble him not at all and, though I can’t judge its phonetic perfection, he sings the part as people sing in their native language, though this too is a role debut. I didn’t particularly remember that Belmonte and went in without expectations. I now eagerly await my next opportunity to hear Burden. In the thankless role of Steva, Scott Quinn impressed with his squillo and his willingness to throw himself into the role of a Moravian village douchebag. Other fine contributions came from Anthony Reed as the mayor, Jill Grove as Grandmother Buryjovka, and, well, pretty much everyone else. Jiri Belohlavek found every ounce of urgency and obsession in the score. The entire second act was, and I use this word sparingly and reverently, harrowing. Olivier Tambosi’s production (from Hamburg, but as far as I could see identical to the Met’s) has lost none of that feeling it has always had, of existing at the intersection of slightly embroidered realism and pure archetype. If Gockely saved this as the capstone to his career in San Francisco, he chose well.